When you copy and paste a block of text into Microsoft Office Word document from external source or third party documents such as web browser or another documents, the existing hidden formatting from the external documents on the pasted text block will also be pasted into the existing Word document, thus affecting the size or font, or have the different size or font from the existing document. 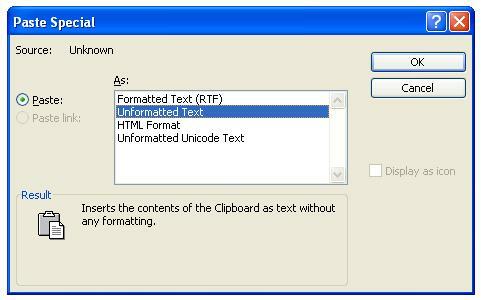 To solve the problem of different font type and font size when copying and pasting from other documents, newer version of Microsoft Word such as Microsoft Office Word 2003, Word 2007, World 2013 and Word 2016 has built-in functionality to let users to choose the style or formatting that they want to apply to the text block that is been pasted. The Word formatting options will be prompted when the text block been pasted and appeared as expandable icon. The options available include Keep Source Formatting (maintain original font type and size of copied text), Match Destination Formatting (change the font type and size of pasted text to match the existing document), Keep Text Only (text only just as it’s been typed, discarding everything else) and also ability to let you apply your desired style or formatting. Alternatively, the manual formatting of the text block can be removed when copying and pasting by using Word’s Paste Special feature. To use the Paste Special feature, highlight and copy (or pressing Ctrl-C) the text or block that you want to paste into your document. After copying into clipboard memory, go to your document when you want to paste the text, and instead of pasting (also Ctrl-V) directly, go to Edit menu, and then choose Paste Special. On the Paste Special menu, choose Unformatted Text to strip the formatting out of the to-be-pasted text. If your Word document also have a block or a chunk of text inside the document that you want to remove its formatting, or you have already pasted a text and unable to remove the text’s formatting, there is another solution. Highlight the block of text or the item that has been pasted, and then pressing Ctrl + Space Bar. The Ctrl + Space Bar keyboard shortcut will force the highlighted text to use and apply the formatting of the document or paragraph it has been in.